I am one of the initiators and the current coordinator of the biennial AndiNA international workshops https://andinabbar.weebly.com/. AndINa’s workshops have one primary objective: to initiate greater debate amongst scientists. They thus fill a void left by traditional conferences and workshops. There are no presented papers describing the participants’ latest results, just full-on dialogue about where real progress will come from, the hallmarks of successful research, the limitations of current approaches, and what we must to do to achieve our future goals. By bringing people together in this unique way, we hope to lead the way by publishing our deliberations and initiating new collaborations. We have held four workshops so far, with two more being planned. 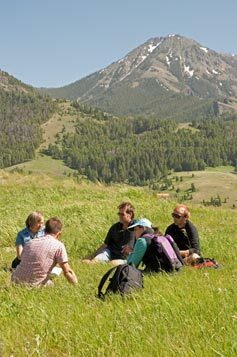 The first, in Montana in 2012, had the aspirational title of “Raising the Bar”, to identify approaches and directions that would achieve more effective research; the second, in the Spanish Pyrenees in 2014, was designed as a “Science Incubator” to develop ideas on spatial ecology and management, population genetics and seed banks. The third, in Alberta in 2016, addressed “transdisciplinary” research, challenging social scientists, ecologists and production systems scientists to explore, through a case study involving local land managers, how – or indeed if – this concept can achieve improved management of invasive plants. In Argentina in January 2018, we brought together scientists from the disciplines of ecological modelling, field ecology, evolution and bioinformatics, to debate the challenges and approaches of those working on species range shifts and local adaptation. The next is likely to be in Eastern Europe in June 2020. 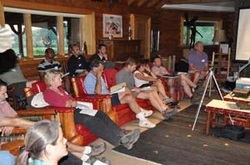 For each workshop, 25-35 participants are accepted from around the world, balancing discipline expertise, general knowledge about weeds and their management and international representation. No financial inducements are offered, but there has been no problem filling vacancies (about 50 people had to be turned away for the 2018 meeting). One third of places is reserved for early-career researchers, via a competitive process. This balance between youth and experience has proven to be crucial to the workshops’ success. We keep costs to an absolute minimum, making the workshops extraordinarily cheap. There are no exorbitant conference fees or additional accommodation costs, only an all-in-one charge that covers venue costs, accommodation, all meals and local travel (but not alcoholic beverages). Limited funding is obtained from various national organisations and industry groups to subsidise the cost for young scientists. Attendees must find their own travel costs to the closest airport. Rather than following the same format all week, the days are interspersed with all sorts of ways to engender debate. No one gets to sit in stuffy rooms for hours on end, brain-dead, desperately trying not to fall asleep. We have had “soapbox sessions” for people to speak their minds, graffiti boards, informal evening events to get people to know each other really well (and hence more likely to collaborate); our next organisers have the mandate to innovate, so who knows what will happen….. Every afternoon, we have “free range”, where people can hike together and do whatever the venue has on offer, to discuss issues informally and to help develop closer interactions. Our locations are truly spectacular, unlike any conference venue that you have been to before. We scour the world to find the right position, so that we can be “away from it all”, the right scenery to inspire the mind, and the right facilities to be comfortable and at ease.